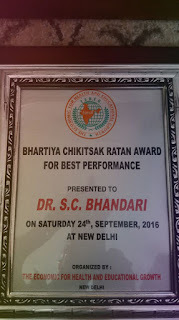 Dr. S C Bhandari, a renowned eye specialist in Jaipur has received the Bharatiya Chikitsak Ratan award at constitution club, New Delhi for his outstanding performance and services to the mankind. 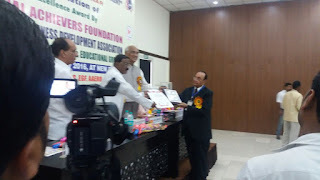 Global Achievers Foundation has selected Dr. Bhandari for the award and The Economic for Health and educational Growth organized the ceremony. Ramdas Bandu Athawale, The union minister was the Chief guest at the ceremony. Dr. Bhandari had been serving at Nanavati hospital, Mumbai as an eye specialist and also acting as official eye specialist for Indian cricket team. He left the prestigious jobs and started serving humankind free of cost. He joined Amar Jain Hospital at Jaipur, a charitable healthcare institute and is serving there till date for philanthropic causes. 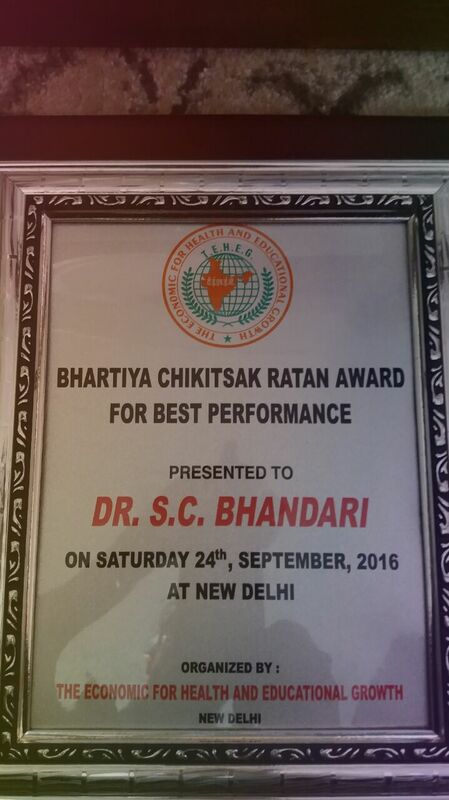 Congratulations to Dr. Bhandari and his family for this felicitation.